In an independent poll conducted by Insightrix Research Inc., Saskatchewan residents were asked if they were likely to buy at least some of their holiday gifts between Black Friday and Cyber Monday in 2018, as well as how much they plan to spend in each event. Between 2017 and 2018, there has been a slight decrease in likelihood to purchase holiday gifts during this period. Further, while there has been a slight decrease in participation in Black Friday sales, there has also been a slight increase in participation in Cyber Monday sales online. Additionally, in 2018, for those who plan to engage in holiday shopping between Black Friday and Cyber Monday, individuals with at least one child in their household are more likely to purchase holiday gifts between November 23 – 26. Millennials are the age group who are the most likely to purchase holiday gifts between Black Friday and Cyber Monday. Fifty percent (50%) of Saskatchewan residents plan to do at least some of their holiday shopping between Black Friday and Cyber Monday in 2018. This is a slight drop from 2017, in which 54% of Saskatchewan residents planned to shop during these events. In 2018, of those who state they plan to do at least some of their holiday shopping between Black Friday and Cyber Monday, 63% of those with one or more child in their household plan to shop for holiday gifts during this period (compared to 43% of those without), as do 56% of women (compared to 44% of men). By age, those aged 18 – 34 years old (61%) are the group who plan most to purchase at least some of their holiday gifts between Black Friday and Cyber Monday, followed by 57% of those aged between 35 – 54 years and 35% of those aged 55 or more years. Holiday shopping isn’t the only reason Saskatchewan residents may participate in Black Friday or Cyber Monday – of those who don’t plan to make a holiday purchase between Black Friday or Cyber Monday, 13% say they plan to shop on or between Black Friday or Cyber Monday for other reasons. Of those who plan to do at least some of their holiday shopping between November 23 – 26, 71% state they are likely to do so on Black Friday in retail stores. Of this group, millennials (aged 18 – 34 years) make up the largest portion (77%), followed by those aged 35 – 54 years old (72%) and those aged over 55 years (60%). Of the group who plan to participate in Black Friday sales to do at least some of their holiday shopping on November 23, 42% state they plan to spend between $101 – $250. In 2018, 3% state they plan to spend more than $1,000 at Black Friday sales. D3: How much do you expect to spend during Black Friday sales? 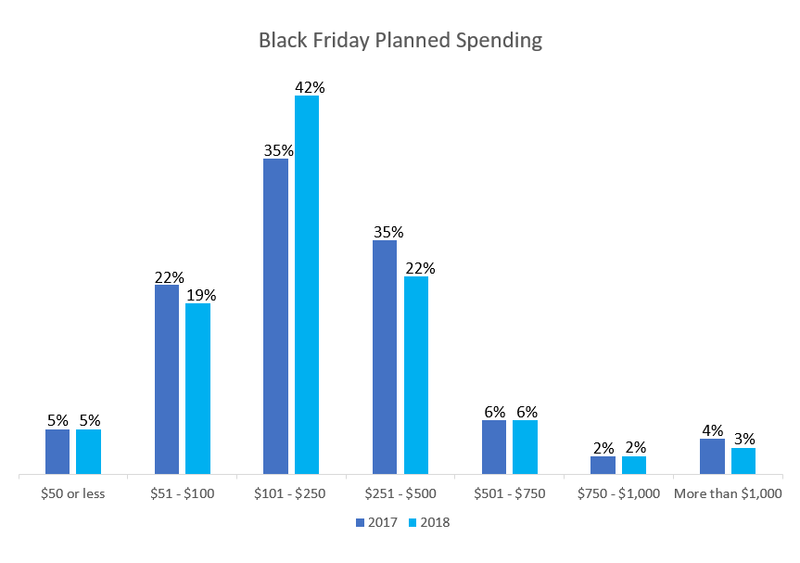 When asked if they plan to spend more, less or about the same amount as they did at Black Friday sales last year, nearly one half (48%) state they plan to spend about the same amount. Further, 22% of men who plan to attend Black Friday sales plan to spend more than they did last year, compared to 12% of women. Almost seven in ten (66%) of those who plan to do at least some of their holiday shopping between November 23 – 26 state they plan to participate in upcoming Cyber Monday sales online. This is a slight increase since last year, in which 64% stated they plan to participate in the online sales event. Of this group, millennials (those aged 18 – 34 years old) represent the largest contingent (77%), followed by those between 35 – 54 years old (69%) and those aged over 55 years (47%). Further, more than seven in ten (72%) of those with one or more children in their household plan to participate, compared to 61% of those with no children. Of those who plan to participate in Cyber Monday sales online, more than three in ten (34%) state they plan to spend between $101 – $250, while 18% state they plan to spend between $251 – $500. D6: How much do you expect to spend online during Cyber Monday sales on November 26? 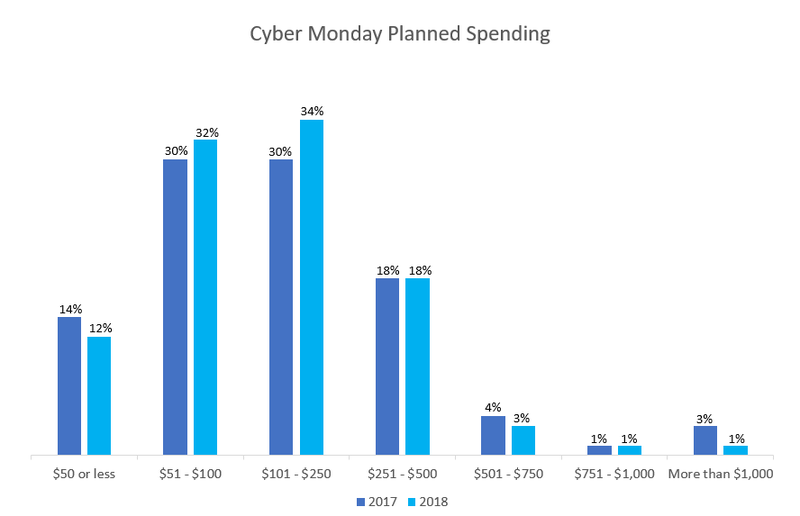 When asked if they plan to spend more, about the same or less than they did at Cyber Monday online sales last year, 13% stated they plan to spend more than they did last year. This is a slight decrease from last year, when 18% stated the same. 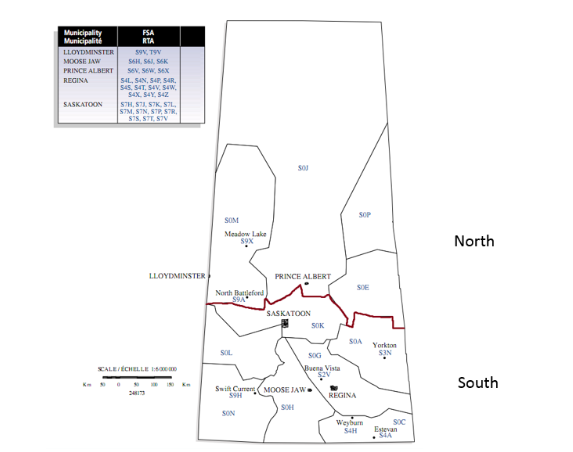 A total of 801 randomly selected SaskWatch Research® panel members participated in the online research study between November 5 and 8, 2018. Surveys were distributed in English language format only. Quotas were set by age, gender and region to match the general population of the province; therefore, the data did not need to be weighted. Since the research is conducted online, it is considered to be a non-probability proportion sample; therefore, margins of error are not applicable. Insightrix began developing its SaskWatch Research online market research panel in October 2007, using high quality techniques including telephone recruitment and referrals from existing panel members. Presently, there are over 18,000 active panel members representing all regions of the province and distributions of the general population. Panel membership closely matches the 2016 Census, based on age, gender, household composition, household income and education. For more information, please visit http://saskwatch.ca.